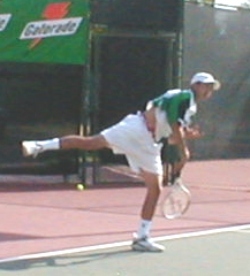 University of Southern California senior Daniel Langre won his matches playing for his native Mexico in the first round of the Davis Cup. The team defeated Jamaica, 4-1, and will play again on April 9-11 against the Bahamas. The Columbia Lions picked up three singles titles at the Cornell Invitational. Freshman Milena Kachar defeated Binghamton's Melis Altinay, 6-2,6-4 for the "A" crown. In the "C" Flight, Kendal Murphy overcame teammate Lucia Aniello, 6-3,6-2. The other winner was Dasha Leonyuk in Consolation "A." In other action at the Invitational, Ali del Moral of Army beat Lion Melissa Nguyen in the "B" final while Anna and Kendal won the doubles consolation. It was a great end of February for Illinois-Chicago when senior Ayca Gumuscu and freshman Artsem Burmistrau were named the Horizon League Tennis Athletes of the Week. It was the second time this season Artsem has received the honor.